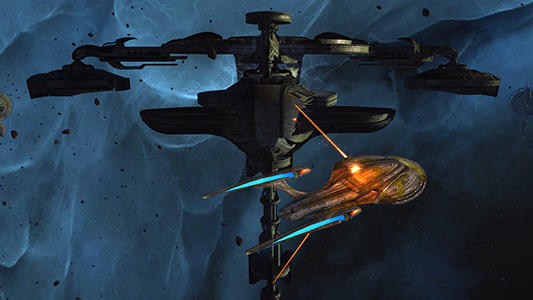 The Mirror Invasion will be returning to Star Trek Online as part of a brand new limited time event starting on Thursday, March 13, 2014, and ending three weeks later on Thursday, April 3, 2014 (when maintenance begins). This revamped event map will only be playable during this three week event timeframe. In addition to earning a choice of marks for playing the Mirror Invasion queued event, players can run a new reputation project to earn a huge reward of Dilithium, Marks, and a unique very rare duty officer (details below). Forget everything you know about the Mirror Invasion. Veterans of STO may be familiar with battling the Terran Empire in the previous Mirror Invasion event, but the new event has been completely redesigned from the ground up. Now players will be defending Vauthil Station, a Romulan Republic space station that Obisek has taken as a temporary command post. Once a day, players will be awarded a Multidimensional Transporter for playing this event. 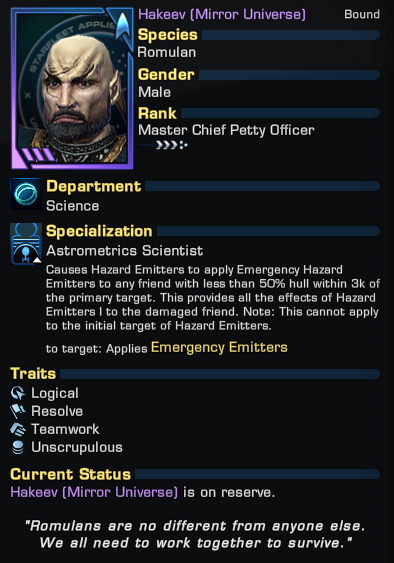 By turning in 14 Transporters through the Reputation System, players will receive 50,000 Dilithium Ore, 500 Fleet Marks, 250 Marks of Your Choice (Fleet, Romulan, Nukara, Omega, or Dyson) and a unique Very Rare Duty Officer – Mirror Hakeev (1 Federation version and 1 Klingon Defense version are available to their corresponding captains and allied Romulans)! Each additional Multidimensional Transporter can be traded in for an additional 50 Fleet Marks, 2000 Dilithium Ore, and 35 Marks of Your Choice (Fleet, Romulan, Nukara, Omega, or Dyson) through a secondary Event Reputation Project that will become available after the main Project is completed. For those daring souls looking for an extra challenge, there is also an Elite mode where you can earn even more marks! The Mirror Invasion is a 5-captain, cross-faction queue for level 50 players. We hope you enjoy this event and look forward to seeing you take on the Terran Empire. See you in-game!